Family Life Radio expands its coverage in Michigan. FLR adds 94.1 FM in Oakland County including Clarkston, Waterford, Pontiac, Holly, Milford, Lake Orion, West Bloomfield (or anywhere in that area). In addition the 94.3 FM signal in Metro Detroit was recently upgraded for a stronger signal to the northwest suburbs. Westside Christian Fellowship Church in Leona Valley, CA (Palmdale) is acquiring four radio stations to stream Christian messages and worship music across the Valley. The Westside Christian Fellowship Radio Network will soon be on the air at KWTD/Palmdale (91.9 FM and 93.3 FM) covering Ridgecrest, California City, Palmdale and Lancaster. And at KWTW/Bishop, CA (88.5 FM and 105.9) serving Mammoth Lakes and other Eastern Sierra towns. The WCF Radio Network hopes to be on the air this week. 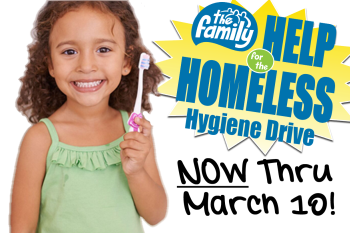 The WEMI Appleton/Oshkosh (The Family Radio Networks) 27th annual ‘Help for the Homeless’ hygiene drive, Feb. 17 – March 10, will collect new toiletry and cleaning products for 89 Wisconsin crisis agencies in 15 Northeast and Central Wisconsin communities. Donations remain in communities where they are collected. More than 900 area businesses, churches, and schools are participating by collecting internally from staff, members and students. The goal of the drive is to supply a year’s worth of products to each agency. Nearly $3 million dollars’ worth of hygiene items have been donated through the event to date.